You can edit the options of a recare type (except for the name of the type if the type is attached to any patient's record) as needed. Changing a recare type that is attached to any patient's record does not affect the recare of any patients who already have that recare type attached to their records. If the type is not attached to any patient's record, change a name for the recare type. Set up the other options, such as the interval and associated procedures, as needed. Type - Type a name for the recare type. You cannot change the name if this recare type is attached to any patient's record. Description - Type a description for the recare type. Interval - Enter a number, and select Weeks, Months, or Years to specify how often a patient with this recare type attached to his or her record should be seen for this type of recare. Each time you schedule a recare appointment for a patient, the due date for the patient's next recare appointment (of the same recare type) advances by the specified interval. Primary Recare Type - If an appointment is typically scheduled around this recare type (for example, a cleaning), select this check box. If the procedures that you associate with this recare type are typically additional services that accompany a primary type (for example, X-rays), clear this check box. Only primary recare types can trigger automated text and email messages for recare reminders. Only primary recare types are available for use with online booking. When you are completing appointments, the scheduling of recare is required only for primary recare types. This appointment task is required only for locations that have been set up to track compliance with the patient checkout workflow. Procedures - Add the procedures that you want to associate with this recare type. Begin typing a procedure code or description, continue typing as needed to narrow the results, and then select the desired procedure from the list. Repeat this for as many procedures as you want to associate with this recare type. To remove a procedure, click (or tap) the Remove button next to that procedure. 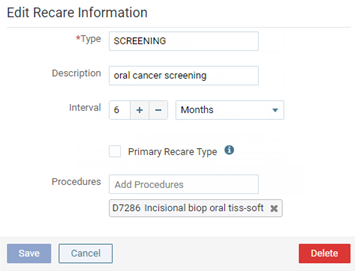 If you associate a procedure with this recare type, when you complete an appointment for the specified procedure, and if the recare type is not already attached to the record of the patient for whom the appointment was scheduled, a message will appear and allow you to choose whether or not you want to attach recare to the patient's record. I am having trouble setting up Re-care. There are some re-care codes that use the same procedure codes and Ascend will not let me tag a procedure code to more than one Re-care code. When you click the settings gears and select ReCare Setup, Ascend will allow you to add multiple procedure codes to each recall type. Can you provide an example of what you are trying to accomplish? Yes I can. I see that Ascend allows me to add multiple procedure codes to each recall type, but once a code has been attached to a recare code, it will not allow me to attach that same code to another recare code. Most of the times I have seen this scenario, offices are trying to have different recare types based upon interval. You have the ability to set the recare intervals on patients individually so the interval on the recare type would be the most common and will attach that interval to patients when the patients have their recare defined. What procedure are you trying to add to multiple recare types? For example, we run the recare codes CC ADULT (Continuing Care Adult) and CC ADULT W/ PERIO (Continuing Care Adult w/ Perio exam). Both of those require D0120. However, when I created CC ADULT and tagged D0120 to that recare code, I was not able to tag D0120 to CC ADULT W/ PERIO. I would see D0120 populate in the procedure search but it would be grayed out with a tag that says "D0120 Used by CC Adult Recare Type). This is a problem because we need to be able to properly tag procedures to multiple recare types. I added this request to our Feature Requests forum. To see, click here. For now, how about creating a procedure code for the Perio Exam. Then attach that to the recall type Perio Exam. 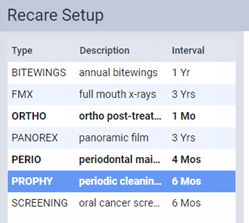 If you are doing a perio exam once a year, Ascend will tell you when that patient would be due for it and then you can schedule that reall type in addition to the Prophy. Just a thought. That is a temporary fix for a perio exam; however, we run recare types with multiple types having the same procedure codes, and the perio exam was merely an example.